Neighborhoods are flooded after the storm surge from Hurricane Florence flooded the Neuse River Sept. 14, 2018, in New Bern, North Carolina. 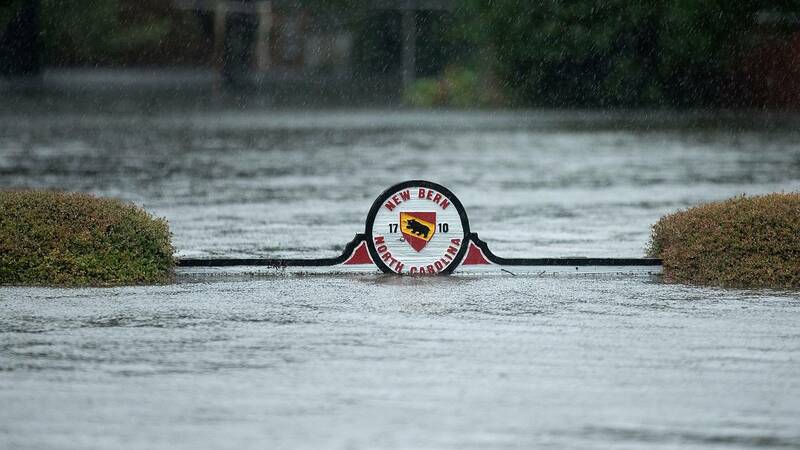 (CNN) - After enduring more than 10 feet of storm surge and almost 9 inches of rain from Tropical Storm Florence, the city of New Bern, North Carolina, said Saturday it has completed all water rescues. Mayor Dana Outlaw told CNN that more than 400 people had been rescued. About 4,200 homes have been damaged, he said. "We have completed all of our water rescues & want to sincerely thank all of the volunteers who helped us save lives. You rock!" the city tweeted. "We couldn't have done it without you! If boaters are looking to help, pls reach out to other communities who might still have needs. #operationthankyou"
New Bern, home to approximately 30,000 people, sits about 37 miles northeast of Jacksonville on the banks of the Neuse River. Thursday, a CNN team in the area watched as the water spilled over the edge of the river and flooded Union Point Park in a matter of hours. Resident Peggy Perry told CNN she and three relatives were trapped inside her home. City spokesperson Colleen Roberts said rescuers faced very challenging conditions. The storm surge had decreased to about 8 feet later Friday morning, Roberts said, but that was mostly attributed to changes in the Neuse River's tide. According to Roberts, citizen volunteers with their own boats have offered to help the city coordinate rescues. Ariel Heath broadcast on Facebook Live to share footage of the situation in the small town of James City, just south of New Bern. She pointed her phone out the window on the second floor of a building showing the property covered in water, littered by downed trees. A short distance away an overturned trailer could be seen. Car alarms blared in the distance throughout the video. Oil had mixed with the floodwater, Heath said, and she described an overwhelming scent of gasoline as she ventured downstairs. "Oh God," she said. "All right, this is gross." The odor soon became so strong it forced her back upstairs to continue filming. "We lost all of our cars last night," Heath told her viewers, "because the water was above the headlights, even on our SUVs." "Last night there was water over the dead bolt locks on the doors," Heath told CNN. "The water has gone down quite a bit." "We know water was inside houses, cars had water over the headlights," she continued. "It's just bad -- winds are still really high."